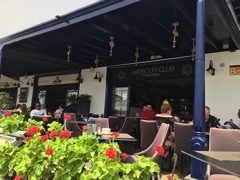 Despite what sounds like a very British name, The Harbour Club is actually Dutch owned, and several people have suggested we try it since it opened a few months ago. I had walked past before to read the menu, and I thought their brunch looked really interesting, but we arrived with friends at lunchtime, so we went with the lunch menu. We managed to flummox the waiter at first by asking for a table for five, and after a great deal of table shifting, he managed to create one for us, in the shade, but on the terrace. The restaurant is in the line that looks right over the boats and main walkway, so it’s a great place to watch people coming and going. There was an excellent range of food on the menu, from baguettes to full blown main courses, and between us all we tried a steak, the Angus burger, chicken satay and ravioli. 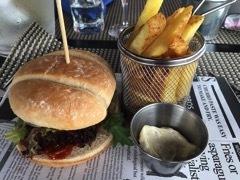 I went for the Angus burger – a large home made minced steak burger, served with cheese and various pickles and sauces, with fries on the side. The menu warns it will be cooked medium rare, it was, and it was really, really tasty. Jules chose the chicken satay, which was served with salad, prawn crackers and chips. It was a large portion – the chicken was both light and dark meat and covered in a really thick, rich satay sauce. Our friends declared the pasta and steak to be very good, and the steak looked amazing – I did have a little food envy! 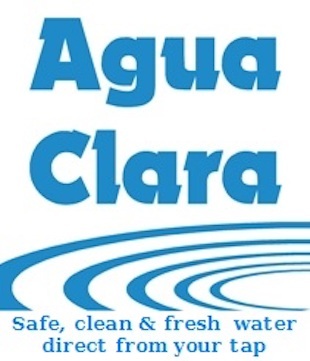 The service was good, although we waited too long for the food to arrive, which was surprising as the place wasn’t busy, so perhaps not a place to go if you are in a hurry. One thing to note is that 7% local tax is not included in the menu prices. Prices range from €6.50 for baguettes, served with fries or salad, up to €17.50 for the most expensive fish and meat dishes. There is a small children’s menu. All in all, a great experience. 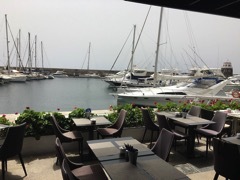 The Harbour Club is unpretentious, the service relaxed and informal, the view spectacular and the food is top class. 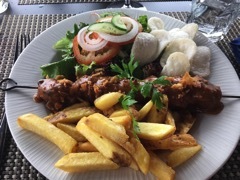 See more food reviews in this section of the website: Lanzarote To Eat. 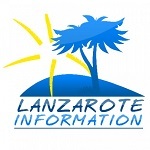 Please note: We don’t inform restaurants in advance that we’re coming to write a review, nor do we receive any payment or benefit in kind for our restaurant reviews, our aim is simply to tell you about food in Lanzarote.